The Joby Gorillapod SLR-Zoom with Medium Ballhead is an ultra-versatile mini-tripod or grip that can be used with large SLR cameras with zoom lens attached or with camcorders (max. load capacity of 6.6 lb/3 kg). Its three multi-segmented flexible legs can be formed to grip almost any protrusion, be it a branch, doorknob, rock, or uneven surface. Each of the joints can bend and rotate 360°, to wrap around objects. The bottom rubber segment on the legs is larger to allow it to be used in the traditional way. The included Medium Ballhead is a ballhead for use with most 35mm, digital & light medium format cameras. It features a large padded camera stage for stability, and an easy to grip locking wheel. Gorillapod SLR-Zoom Flexible Mini-Tripod with Medium Ballhead is rated 4.3 out of 5 by 6. Rated 2 out of 5 by daisymae from Sunpak Medium Ballhead poorly engineered After minimal use and with ordinary care, the ballhead and plate broke, separated or simply failed rendering the ballhead useless. The design of that joint leaves much to be desired. That plus the Gorillapod really isn't steady enough for a Nikon D-70 with any zoom in my case. Rated 5 out of 5 by Phloodpants from The best tripod is the one you always have with you... ...And I always have it with me because it fits in the bag.This is a great gadget! I get lots of oohs and ahs when Ishow it to fellow photogs. The Gorillapod is a lot moreuseful with a ball head. Just wrap it around a post, chairor anything else that's handy. (Or just set it up as atripod) The legs really do stay in position and they griplike mad.The included Sunpak ball head is decent enough for the joband plenty cheap. Rated 4 out of 5 by El Reto from Wireless Shoe-mount Flash Support! I use the Joby to support my flashes whenever possible. I do a lot of wireless bounce-flash photography using my Nikon D200 cameras, SB-800 and SB-600 flashes. I prefer using the Joby instead of my light stands since it can be placed high-up and out of the way of clumsy feet. 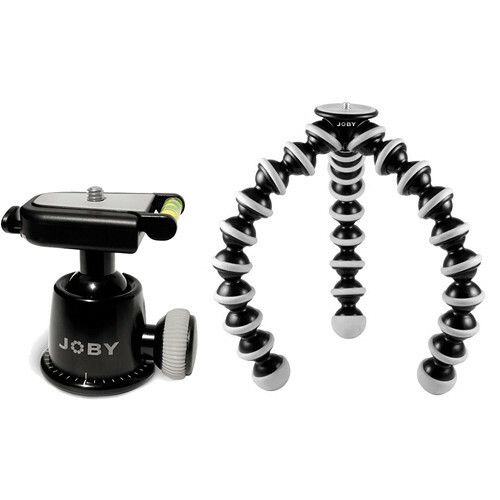 Of course, you do need something for the Joby to grab on to. This limitation is dependent on the location. Rated 5 out of 5 by 0eyvind from Recommended? Yes! Great for travel, hiking, biking, macro, everything.. It fits in everything, fits on everything, grabs on everything. The most handy accesory i have at the moment for my dslr. A little hard to adjust smetimes, but that only results in better stability - you can't have everything! I'll recomend it to every camerauser i know.